Despite my travels this month, it did not preclude me from packing in some fun foodie adventures! I had just returned from a ten-day trip to Europe where the food, as you know, is absolutely phenomenal. Needless to say, it had raised the bar for what I would consider “good food,” anymore. I couldn’t have asked for a better welcome back to the United States and a reminder, that regardless of all the good food in the world, Chicago does it best! And that’s all thanks to Shaw’s Crab House. I was invited in to try their Grand Buffet brunch as part of their ten-day Oyster Fest, which was intended to feature some special oyster dishes in addition to other seafood. Back for the 29th year, Shaw’s was hosting several different oyster centric events during these ten days. So I went in with a guest to cure my jet lag with some much needed seafood. We sat in their dining room, which is also my favorite area of the restaurant. I was instantly and positively overwhelmed with the expansive buffet spanning across two rooms, with a chilled seafood bar, a hot bar, a fried foods section, an omelet section, and a dessert bar. We started with the classic and the white peach mimosas to jumpstart our appetites, and then headed straight to the food. First pick was the classic-cured and pastrami-cured raw salmon petals that had been nicely presented on a tray. The sushi selection was extensive with a few vegetarian rolls strewn in. Nothing makes me happier than seeing plate of Chilled Shrimp and Oysters, both of which were extremely fresh and tasty. The Oyster Chowder was piping hot with a smooth salinity to it. I smiled as I ate the soup while chowing down on some delicious Oyster Rockefeller on the side, and was all-around oyster happy. Round two was the Warm Crab Legs served with butter, which was also delicious. At Shaw’s, the quality of their fish always speaks for itself. 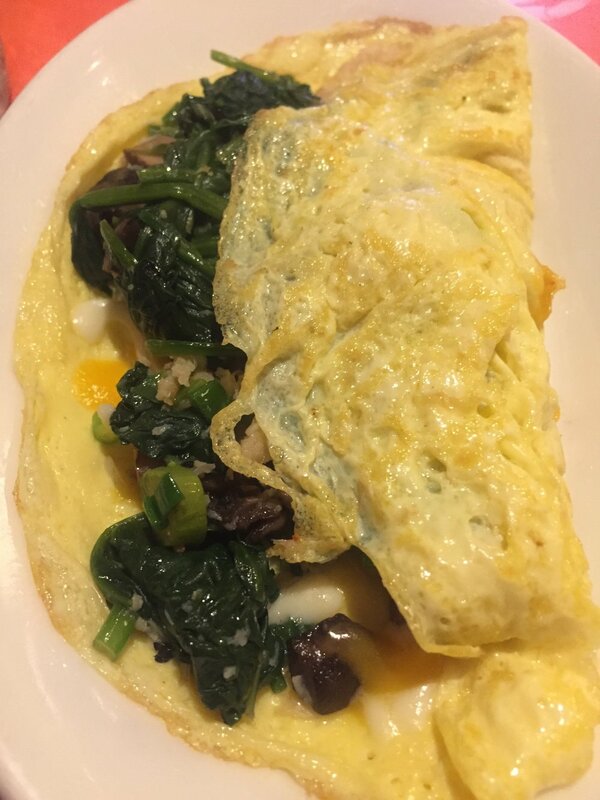 I then ordered a crab omelet from their omelet station, and picked spinach and asparagus as my fillings. If I may take a little credit, the combination was superb and I would urge you to try it! For meat lovers, there were plenty of options too; a meat carving station as well as some yummy candied bacon which I heard guests raving about. The Dessert Section was enormous, although I had to wait almost an hour before I could try any dessert. But as you know, my commitment to dessert never fails me. I came back with a tray full of donuts from Do-Rite, a couple of warm chocolate chip cookies, several chocolate covered strawberries and a small cup of their Chocolate Mousse.The highlight as usual however, was the Butterscotch Pudding, a Shaw’s specialty I’d say. No one should leave this place without trying it. I pretty much waddled out of the restaurant, happy as can be. For $59.95 a person, I can assure you that you will get more than your money’s worth with this brunch. I couldn’t have asked for a better first meal back in the States. If you haven’t been to Shaw’s brunch yet, go check it out now. And, you’re welcome! The welcome back continued with a brunch feast at Manny’s Deli. I’ll be honest that this was my first time at this Chicago staple and quite honestly, my first time at a Jewish deli ever. Owner Dan was waiting for me and my guest when we arrived and gave us the grand tour of their beautiful, newly renovated space, with three expansive food bars, one dedicated just to desserts. Dan mentioned how they were one of last few cafeteria-style locations left in Chicago. Dan had a beautiful Lox Tray waiting for us that comprised of Center Cut Nova Lox, Hand Sliced Gravlax and Pastrami Nova Lox. It also has their peppered and smoked sable, strewn in with lots of raw veggies. Each slice of fish was cut nicely and had unflawed brine to it. We didn’t, but you can add a side salad, cookies and brownies to any tray if you’re so inclined. Of the tray, I leaned towards the cold-smoked pastrami flavored salmon because of the delicious spice rub on it, which was simply irresistible. We then ordered a medley of their house-made bagels, smeared their popular chive and salmon cream cheese on it, placed some of that tasty lox on it and took large bites of the lox bagel we had just created. Every element of that sandwich was delicious! I had been on a milkshake kick the week before, so I wasn’t going to pass up on their Chocolate Milkshake, aka dessert. The whipping cream and the scoops of chocolate ice cream truly made this a chocolate lover’s dream. I didn’t want to fill up on it, or there would have been no stopping at one. From their hot bar, Dan recommended their creamy Macaroni & Cheese, the Baked Whitefish and the Noodle Kugel. The latter, a Jewish delicacy was a first for me, but this velvety custard-consistency casserole was absolutely delicious. I especially liked the raisins in it as well as the crunchy noodles on top. The desserts were insane! I don’t think there was one not covered; everything from pies, cakes, cookies and brownies were offered at their dessert station. I also loved seeing all the sports decorated cookies representing all the Chicago teams, which got me in the spirit for football Sunday. When I heard that Obama had taken a liking to the Cherry Slice on his visit, I had to try it. This was basically a pie with lots of icing and was very, very tasty. Their Caramel Cake however took the cake! A tender, yellow cake with a nice, thick caramel frosting was a true labor of love. With whatever energy we could amass, we toured their Deli area, where they offer La Colombe coffee and other to-go items and then made our way out. I simply can’t get over this wonderful tasting, so many great, affordable options for breakfast, brunch or lunch. Oh and did I mention the entertainment? There was a magician going table to table performing card tricks, which patrons absolutely loved. Chicagoans, Manny’s is a must! Aint’ no party like a Gibsons party! I attended a private opening of the new Italian steakhouse this month, and the newest offering from the Gibsons Restaurant Group, and it was magical. This three-storied building comes with lavish interiors, with the most modern decors, offering some of the best views of the city and river. The third floor bar actually has a retractable roof. All three floors were buzzing with food, drinks and music as guests sipped and celebrated at the private sneak peak event. The seafood was plenty on the menu and I got a nice preview of some of the finest fish dishes while there. Highlights for me food wise, were the Tuna Bites served on cucumber, and the Crab Cocktail being passed around with the freshest crabmeat, onions, tomatoes and cilantro. The presentation was unbelievable on both and fish was fresh as expected. The rapinni on the vegetarian bruschetta was such a great touch, and the Arancini a crowd favorite. There were girls walking around shucking oysters for guests on the spot and now I think I found my Halloween idea for this year. The wine and drinks were flowing and who’s who of Chicago graced the event. It was seriously one big party that obviously went on longer than it was supposed to. I mean, who would want to leave such a beautiful space and all that fun. I have no doubt that the restaurant will become the new city favorite this season. And I got a parting t-shirt to always remind me of just how wonderful this event was! 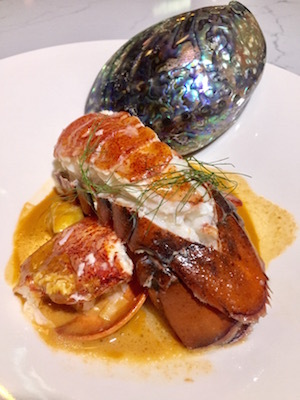 Last month it was at the unmasking of the Dana Hotel And Spa, that I discovered Portsmith, their new seafood focused restaurant, which sits on the first floor of the hotel. Since then, I have been eager to return and finally got to visit for a menu tasting. Portsmith is a restaurant like no other, and I say that as a pescetarian who has been on the hunt in the city for a restaurant that truly honors seafood in the way that it should be. The most sustainably sourced seafood presented in the most artistic way, without needing any frill, is what Portsmith is about. And despite the simplicity, every dish still manages to to make a lasting impression. As soon as my Portsmith Mojito arrived with rum, Belvoir ginger, lime and mint, I knew that there was a phenomenal meal ahead of me. Dinner began with an order of the Fried Oysters, a restaurant specialty I was told. The presentation was one of the best I’ve ever seen, with the oysters laid out on a wooden platter and each oyster carefully plopped on a bed of salt, fried in a Squid Ink Panko and garnished with basil, aioli and trout roe. I almost gasped in excitement as I took my first bite of this delicious fruit of the sea. The Cacio De Pepe was presented with a unique take, and tossed in silky uni butter, then mixed in with black peppercorn and caviar. Need I say more? Only Chef Henssler could make this basic pasta dish such a trendy one. The King Crab Louie was my favorite from the night. And the version here definitely lived up to its name of being the ‘King of Salads.’ Chef’s take was with melon, avocados and a tasty Louis dressing. The salad, which dates back to the early 1900s, and believed to have been named after King Louis, was one fine dish at Portsmith. Made me feel like every bit like royalty. The Cheddar Parker House Rolls were so unbelievably good! I almost had to pinch myself when they arrived. They were fluffy, mildly sweet and super soft, especially after being dabbed in a little Old Bay Butter it came with. Portsmith does a creative, healthier version of Fish And Chips, which I also got to try. A phenomenal pan seared Halibut sitting in a malt vinegar jus and sliced potato chips, was not only delicious but also very fun. Definitely took the guilt out of this otherwise greasy classic. The other two dishes that left me wanting more were, the Maine Lobster and Tortellini with Tomato Couscous.The Turbot which I also ate, wreaked black truffle in addition to the already truflle beure blanc sauce it was reduced with. Nothing makes me happier than a truffle overload. Finally we made our way to the dessert, which kept its end of the bargain too. Both the Almond Cake and the Chocolate Ganache were heavenly. And several others on the dessert menu I wanted to try but was too stuffed for. You know what that means; I’ll just have to go back. Portsmith is a pescetarian’s dream, and lets you enjoy fresh, creatively created seafood in a soothing ambiance. I’m so excited we have this in our city now! Hakka Bakka is no unknown territory for me. I had been to their opening a few years ago and I also grew up eating kathi rolls, which is a popular Indian street food. I remember being absolutely floored at their soft opening even, yet secretly hoping there were seafood options on the menu. You know me; I would make a seafood version of everything if I could. So I jumped at the opportunity to go in and try their new shrimp dishes, recently introduced on their menu. Hakka Bakka is a cute space with lots of fun Indian themed wallpaper and a wall dedicated solely with drawings to explain how the menu ordering works. They keep it simple here and everything is fresh and made to order. I ordered a few Kathi rolls and changed each one up with my filling options. I did the Shrimp Signature and the Paneer (Indian cottage cheese). I also ordered one Shrimp & Rice Salad Bowl, which came on a bed of fragrant basmati (Indian long grain) rice. The rice was sautéed with cumin and the bowl was topped with lettuce, onions and a little chutney, which transported me right, back to my childhood. For the roll, both the shrimp and Paneer cheese were marinated in delectable Indian spices and then rolled into a layered paratha (Indian bread) made straight from Durum wheat. The bread was flaky soft and lightly buttered and everything folded in it well into one scrumptious roll. Is your mouth watering yet? There’s more! I also got a side of their Masala Fries, which were heavenly. Every bite exploded with flavor melded nicely with the crisp taste of potatoes. My heart was full to see a pink colored Rose Lassi being offered as a special in honor of Breast Cancer Awareness month. Severl glasses of this got consumed too. Nothing like a cool glass of sweet churned yogurt to calm your pallete from those amazing spices. I left with a happy belly resolved to return to get more of that goodness and also some chaat (Indian street food also) only offered on the weekends. Imagine coming home from a long day of work to a fully prepared meal made from all locally sourced ingredients, carefully designed by a licensed nutritionist, Chef-crafted and still tastes exceptional. Sounds too good to be true? Well, Kitchfix is a real thing. I experienced firsthand during a visit to their Gold Coast store this month, where I not only got a tour of their cute space but also got to sample some amazing seafood dishes that rotate on the menu. There’s also a gym (Sweat) in the basement and a coffeeshop within the store. All meals here are anti-inflammatory, gluten free and non-dairy. The immediate thought after hearing this is, well then what’s left?! How does one make something delicious without using butter? Leave it to Kitchfix to get creative! I had a medium-sized serving of their Salmon Burger, which came with an aioli, which was unbelievably delicious. The Coconut Crusted Shrimp meal came with a fluffy and hearty couscous and roasted plantains. All meals delivered can be popped into a toaster oven or microwave for heating. Everything is all natural and the best quality. A meal you will feel good about putting in your body and that of your family. Even the snacks are well thought of here and prepared to nourish you. Chef Josh built this company on the philosophy that healthy food is healing food and we owe ourselves to know what we put in our bodies. All nutritional information is provided with each meal. The meals are delivered twice a week and anywhere in the entire Chicagoland area. And if delivery is not your thing, you can pick up your meals from the store or kiosks at several other locations throughout the city; as long as they are pre-ordered. I even got a couple meals hand delivered to my doorstep to experience the full magic of healthy, ready-to-eat cooked meals. They make it easy and they make it well, because they understand that life presents a lot of stressors everyday and food is a big part of living. And that good quality food has far reaching benefits to our ultimate well being. 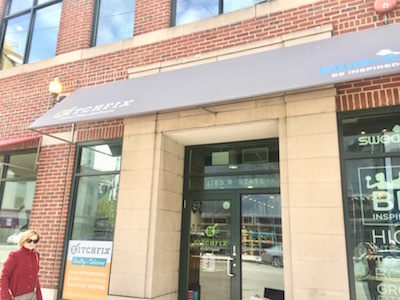 I feel fortunate to have learned about Kitchfix and partner with them to help bring visibility so my fellow pescetarians can enjoy more fish based meals.